Derren Litten’s award winning TV sit com comes alive on stage and guarantees everyone a sunshine evening packed with laughter. It can’t be easy to take a TV show that ran for 10 seasons, beloved by millions and winner of multiple awards and put it onto a theatre stage. After 74 episodes, fans feel like they know everything there is to know about the characters so how do you create something that still feels fresh and exciting without either going over old ground or just making a pastiche (not pasty, Kenneth). Derren Litten has written a stage show that brilliantly feels, for all intents and purposes, like a one off special for the small screen. 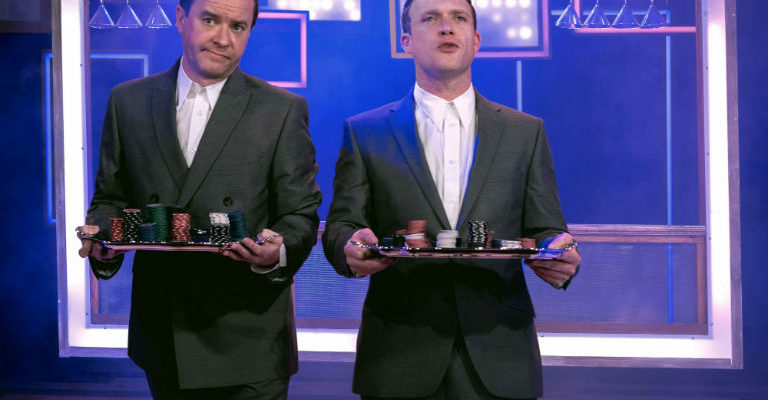 The audience are dropped right back into their favourite Costa Del Sol hotel, the characters act as if there has been no gap since the end of the last episode and, most importantly for fans, there is no time wasted establishing who is who and what is what. This means the pace is immediately high with fans’ favourites entering to rapturous applause and cheers and the familiar surroundings of the Solana, Blow and Go and Neptune’s enveloping the audience like their warmest winter duvet. The tour is due to run for over 200 performances and this show is packed with fun to keep people coming back for more, time after time – in fact it is possible we may have just watched a modern cult show being born. There is every chance, a la Rocky Horror, that many fans, having seen it once, will dress like their favourite characters and keep coming back for an almost communal night out. Choosing which characters to use after so many episodes can’t have been easy; fans of the show feel they have grown to know many of the families – the Gravies, the Dawsons, the Matlbys, Les and Leslie and as such will always have their favourites, but the genius of Litten’s writing is that those not on stage are not missed, it just feels like they are somewhere else in the hotel at the time. 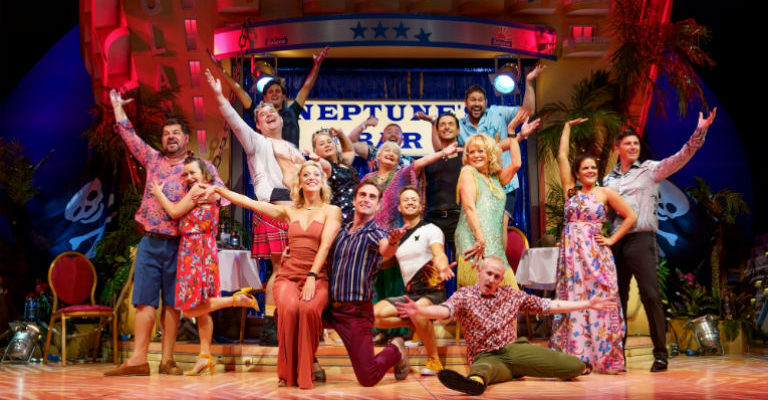 Of course, those who are on stage ensure that the core essence of the TV show remains strong; Matteo’s failed attempts at womanising, Joyce’s desperate approach to hotel management, Kenneth’s love of all things Benidorm, Jacqueline’s pursuit of carnal pleasures to name but a few. For an actor, TV can be quite a forgiving medium in which to work. Multiple takes, multiple camera angles, dubbing, even stunt and body doubles can all be used to ensure the final cut is perfect. On stage there is no such luxury, no safety net of fixing things in post. This makes the comedic timing, singing, dancing and delivery of Litten’s word plays (at times his writing is like a cross between Alan Bennet and Victoria Wood) all the more impressive. The cast never missed a beat, from Matteo’s flamenco dancing to Sam’s brilliant singing, from Liam and Kenneth’s love/hate/love to Jaqueline’s double entendres they were word and pitch perfect. You may have noticed that I have not delved into the story or any of the stand out moments – believe me, I would love to as I have already told many, many people, but it wouldn’t be fair to spoil the surprises so instead I will say – if you loved Benidorm the TV show and mourned its passing after season 10 then this production is guaranteed to fill your evening with belly laughs, gasps and groans and leave you with the warm all over glow that only a day in the hot Benidorm sunshine can.